For “Spare Parts” credits, our concept artist Ross Burt offered to make some retro 8bit rolling credits and he created an 8 bit avatar for the core team. Here are some screenshots followed by the entire credits. Ianimate just released their first showreel. Some really nice work is being done there but what else would you expect from a school taught exclusively by Dreamworks animators! If I had to restart my animation schooling I wouldn’t know where to go between all the great schools available those days! Big up to my AM fellow graduates Joost, Dave and Roberto for making it into the showreel. I recognized a lot of other familiar names! I am not a fan of walks “on the spot” and in games I never had to make one but Kyle Balda’s workflow seems really effective. No step blocking here, he starts immediately in spline, which technique I am finding, a lot of very fast feature animator tend to favor. Rob Thompson gave us a similar demo at the Animation Collaborative and Rob was originally a 2d animator. 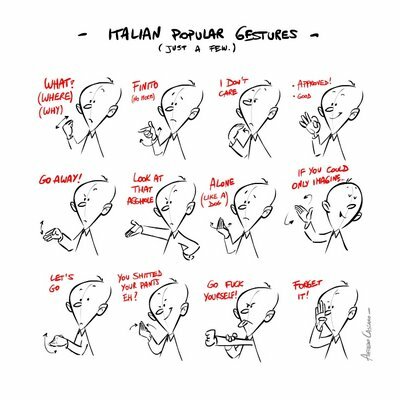 Great reference for gestures or give personality to your characters. Alfredo Cassano posted a nice series of illustrations on his blog. Make sure you see the three of them and maybe buy his book! 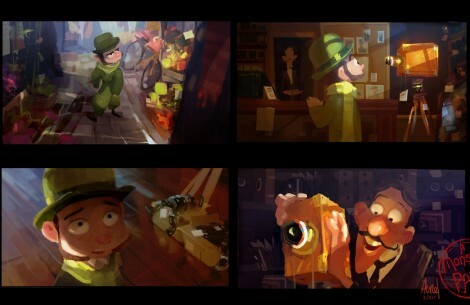 Aurélien was involved in the never ending production of french animated feature “A monster in Paris” and he just posted some unbelievable colour keys he made for the movie. 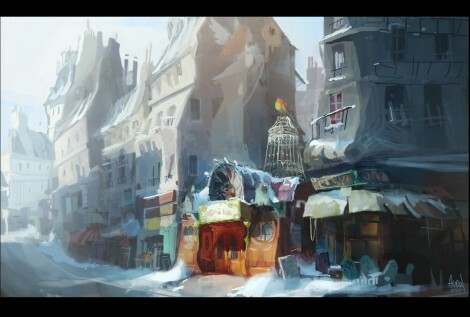 If you are interested in painting or lighting you should definitely have a look at his blog, his work is exceptional. To me he is just as good as people with 5+ years of experience and he probably made those colour keys, two to three years after graduating. If you didn’t know, Aurélien was also a contributor to the Sketchtravel project. As a side note, with 1.7 millions tickets sold, the movie did very well in France but so far it hasn’t covered the 27 millions euros the movie cost, making it a loss for the production company, Europa Corp.
A US release would be really expensive for Luc Besson’s company but they could probably do a UK release first. The British market is usually the second biggest territory in term of sales, ahead of Japan. Few people wanted to see this guy animated so here it is. Believe it or not this was animated in Maya. I placed the walk cycle on a nurbs plane and animated the UV :-) I have been told I could have just used Photoshop. I will give it a try next time or maybe use Plastic Animation Paper since it is free. and while I am at it, here is a little teaser I made with my new camera using some footage I shot during my last Animation Collaborative character design class with Albert Lozano and Chris Sasaki. Hurry up, Animschool just posted an special interview with Disney veteran Tom Bancroft. The interview will only be available to the public for few more days so make sure you don’t miss that exceptional interview. I have only seen the beginning so far but Tom animated one of my favourite characters on Mulan, the crazy talking dragon Mushu. People too often forget that there is no one Disney animation style, it all depends on the story and the character of the character. Mushu is a great example of the exaggerated Disney animation style. As I very often check the box offices grosses of my favorite animated features, I decided to finally organize those information in a centralized/easy to read table and share it with you. I will post the updated table on my blog every few month and maybe add older features. Ahah! Just when you thought you had seen enough trailers for Lorax, a new one pops out! Trailer 2, technically speaking is actually the third one but I am guessing they finally considered the first one a screw up since it was a bit confusing regarding who those male characters were. Trailer 2 is not giving away a lot more and making things a lot clearer. The trees we thought were populating the streets of Thneedville are actually made of plastic!! Makes sense!